The advances in mechanization, genetic improvement and some silviculture techniques that were innovative at the time and are now considered almost universal, have allowed species such as poplar, eucalyptus or pine to become profitable forest products in Europe, and with a promising future in the context of the new bio-economy. 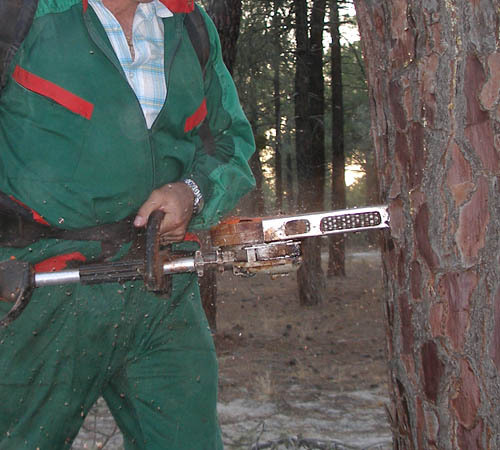 Over the last few decades, forestry activities have undergone considerable technical evolution based on the incorporation of specialized machinery and technology. However, the activity of extracting resin, which has been almost extinct in Europe since the 1980s, seems to be reviving after a prolonged period of crisis, and it does so in the time of high technology, but anchored in traditional methods and techniques of exploitation. The new resins use the same tools as their ancestors in the 1960s. The cessation of production in turn meant a halt in the process of modernising the activity. The development of a crude pine oleoresin extraction system that improves the performance of the resin worker is one of the greatest innovation challenges in the natural resin sector, and the mechanization of the labours is one of the most advanced lines of research to achieve this purpose. In this sense, Spain is leading an initiative through the Resimec operational group, promoted by the Spanish Agricultural Guarantee Fund (FEGA) through the call for aid for the creation and operation of supra-autonomous operational groups in relation to the European Association for Innovation in Agricultural Productivity and Sustainability (AEI-Agri) within the framework of the National Rural Development Programme 2014-2020, for the year 2018. Thus, the first meeting of the supra autonomous operational group Resimec (Mechanisation for a productive, sustainable and integrated resin extraction in the multifunctional use of forests) took place on 9th July, with the aim of contributing to the increase in productivity and sustainability of the natural resin extraction activity, providing technical improvements in three key areas: innovation in natural resin extraction methodologies by means of mechanization, advances in the integration of resin extraction in the multifunctional use of forests by applying mechanization in new multipurpose forestry techniques, and the development of a system to assess in forest management that will allow workers, forest owners and managers to decide how and when to integrate mechanization in the use of resins in their forests. The project is based on the application of innovation in the area of forest mechanization from existing prototypes and methods such as, among others, the bark cutting machine developed by Cesefor. This project capitalizes on some of the developments made in the Interreg Sudoe co-funded project SustForest. One of the specific objectives will be to evolve the existing prototype to a pre-marketing stage, thus providing the resin community with a new tool that is easy to use and light-weighted, while maintaining similar or improved production performance compared to traditional systems. The operational group approaches the work from the perspective not only of the optimization of resin production and the productivity of the stands but, above all, to facilitate the compatibility of the extraction of resin with the other forest productions. The diffusion and qualified advice will be another of the pillars of Resimec developing a platform focused on providing the necessary information for the correct application of the innovations in exploitation and forest management by means of the introduction of the land variables and other conditioning factors of the exploitation. The entities that form part of this operational group, as beneficiary partners, are Cesefor, the Centro de Investigación, Desarrollo y Experimentación, S.L. (CIDEX); Sociedad de Resinas Naturales, S.L. ; Confederación de Organizaciones de Selvicultores de España (COSE); Federación de Asociaciones Forestales de Castilla y León (FAFCyLE); Asociación para el Desarrollo Integral de Sierra de Gata (ADISGATA) and Centro de Investigación Forestal de Lourizán.